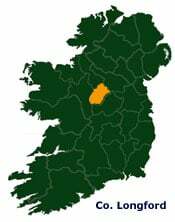 One of the loveliest of the Irish midland counties, County Longford lies in the Shannon basin and the upper catchment area of the River Erne. Longford is famous for its excellent fishing. Head for the lovely town of Lanesborough and the area around Lough Ree to enjoy some great angling. Attractions in Longford include the heritage village of Ardagh, built in the 1860s to a Swiss design, and the recently discovered Old Bog Road, an Iron Age trackway of large oak planks in a bog at Corlea. The true beauty of Longford lies in its pleasant views – it is a quiet countryside of farmlands, bog and the occasional low hill. An ideal spot for a get-away-from-it-all relaxing break.